It has been two days since AMD unleashed their new graphic cards which include the Radeon R9 280X, Radeon R9 270X and the Radeon R7 260X. The cards have been reviewed and we did a round-up on the cards from every major tech site which can be seen here. During their testing, HardwareCanucks managed to find out that the Radeon R9 280X was CrossFire compatible with the Radeon HD 7970. This means that users who currently own a Radeon HD 7970 and are looking to add in another Tahiti in CrossFire mode can now do so with the Radeon R9 280X which is cheaper than most of the HD 7970 model’s currently retailing online even though they boast the same specifications. We came to know days before launch that the Radeon R9 280X was actually based on the Tahiti XT chip which features 2048 Cores and 32 ROPs. The Radeon R9 280X is based on the same chip with a variety of non-reference models featuring various frequencies. 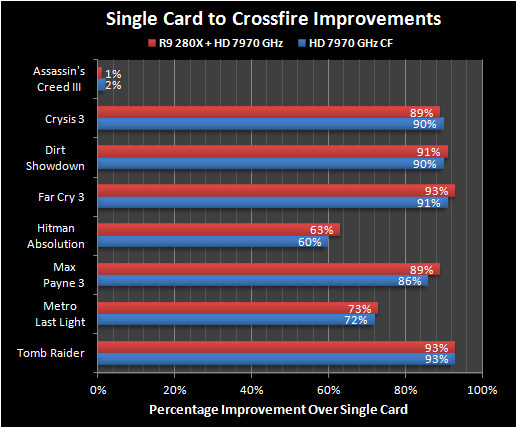 HardwareCanucks also reports that the Radeon R9 280X isn’t the only card that enables this kind of CrossFireX comparability. 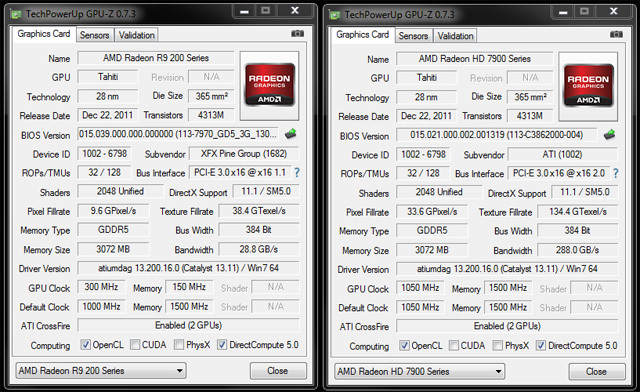 The Radeon R9 270X which is based on the Pitcairn XT die codenamed to Curacao XT features the CrossFire compatibility with Radeon HD 7970 GHz edition, not the Tahiti LE model. Similarly, the Radeon R9 260X is CrossFire-Compatible with the Radeon HD 7790, both of which are based on the Bonaire ASIC silicon. This news is really great for AMD users and with the value the new cards offer, its something you can’t miss out.